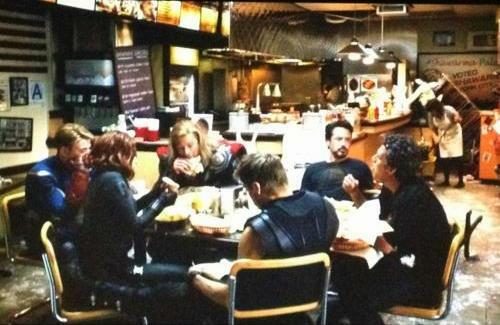 As shown, the Avengers are in a restaurant which is in ruins, with damaged walls, rubble and some signs are down. Bruce Banner seems to be talking loud in this conversation, Tony Stark is using his Black Sabbath t-shirt, he is listening with interest to Bruce, Hawkeye seems to be reading a magazine on his lap, Black Widow is staring at the food of Captain America who seems to be bored. Thor has lost any finesse or manners of a god and is giving a tremendous bite to his Shawarma, he is a hungry god (which we already saw in his first film). During the movie, Tony Stark makes an offhand comment to the team that he knows of a good Shawarma (Shoarma) place nearby. The final scene closes this comment out as it shows the Avengers sitting around a table (above) eating some of the aforementioned shawarma. There is no dialog and no hints as to any new Avengers or anything cool like that. Lets hope this is not the real After Credits Scene, I really wanted to know if Agent Coulson will survive. With the video (recorded from a cinema in the U.S.) is is confirmed that the only scene After Credits is the one with the Shawarma Restaurant, without any dialogue or any look at any future villain. The future villain is Thanos. They showed it mid credits.